The Young Master kept the Oddsguru ball rolling in fine style when winning last week’s bet365 Gold Cup at odds of 8/1. He had been available at odds of 14/1 at the time of writing, but let’s not be greedy! He ran a brave race under talented amateur, and part owner, Sam Waley-Cohen. Having got the last fence wrong he was headed by the runner up but battled back bravely to get the decision in the shadow of the post. He clearly relished the marathon trip and bearing in mind Waley-Cohen’s outstanding record over the Grand National fences he is definitely one to keep in mind for next years Aintree Showpiece. We can be fairly certain that none of Sunday’s 1000gns contenders will ever be asked to jump over the spruce at Aintree, but one thing we can be sure of, is that the winner at the weekend will have covered the eight furlongs of the Rowley Mile in under 100 seconds. The great Henry Cecil had a fantastic record in the race, winning it six times, and the only trainer on Sunday to come close, is French handler, Criquette Head-Maarek. She has won it four times, most recently with Special Duty in 2010 and seeks a fifth with Midweek. Her representative is a filly by Motivator out of a Danzig mare and is a half sister to that very useful miler, (RPR 119) Confront. She has already demonstrated her ability to get a mile, winning over the distance at Saint-Cloud last September and perhaps, just as significantly, in this cold and wet spring, she has had the benefit of a run, which may well confer an advantage over her unraced peers. She was second in a 7f Gp3 (heavy) Maisons-Laffitte contest three weeks ago, where she stayed on nicely. While needing to show considerable improvement to trouble the judge on Sunday, in the hands of genius Criquette, it would come as no surprise if she did. Irish maestro Aidan O’Brien has won the 1000gns twice and fields three, the hot favourite, Minding, Ballydoyle, and Alice Springs. Minding wound up her 2yo campaign with a most impressive win in the Group1 Fillies Mile over course and distance (good/soft) last October, where she came home 4 1/2L in front of Sunday’s opponent Nathra. Prior to that she had beaten stable companion Ballydoyle by 3/4L in a Group1 over 7f at the Curragh, and as the runner up went on to win the Group1 Prix Marcel Boussac at Longchamp, the form is rock solid. While Minding does seem to have outstanding claims, it is worth remembering that both of O’Briens previous winners did have the benefit of a previous outing, and many, including her trainer, think that she may well be suited by further. Ballydoyle, who is reported to be working well, and already boasts a victory over the favourite, (7f Gd/fm) cannot be easily dismissed, but she probably needs top of the ground conditions to excel, so perhaps the third stable representative, Alice Springs is of more interest. A 550,000gns yearling, this Galileo filly, with eight races under her belt is not short of experience, and has run well at the top level, particularly at Keenland in the States last October, where despite being denied the clearest of runs she ran on well to get within 3/4L of the winner, Catch A Glimpse, in a Grade 1 contest. She has had the benefit of a run, at Leopardstown three weeks ago, where she was sent off the 5/4 favourite in a Group3, contest. She was dropped out in the early stages, and left with too much to do on the heavy ground, wasn’t given a hard race. She did come home strongly to finish 3rd and is bound to have benefited from the run. It would come as no surprise to see her outrun her odds of 20/1! Mark Johnston, trainer of Lumiere is very bullish about the chance of this daughter of Shamardal. She has only run three times, all over 6f. 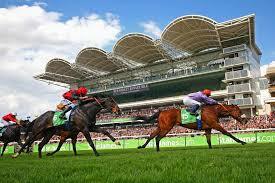 Having won at Newmarket in July she probably found Yorks easy 6f an insufficient test when finishing second, but back at headquarters ran on gamely to take the Group1 Chevely Park Stakes. Her half sister won over 12f and her dam was a wide margin winner over 7f on her only start as a 2yo, so there is plenty of positives on the distaff for Sunday’s trip. Her style of racing also strongly suggests that a mile will suit, so Master Trainer Johnston could well be leading in his second 1000gns winner at the Weekend. Another, who is sure to have benefited from a race this miserable Spring, is John Gosden’s Iffraaj filly, Nathra. She was put firmly in her place in The Fillies Mile by Minding but may not have been best suited by the hold up tactics employed by Dettori. She was quite impressive three weeks ago when ridden closer to the pace, and she won easily under a hands and heels ride, running on well over 7f at Newmarket. Gosden won this with Lahan in 2000 so knows what is required, and must have high hopes of bringing up the double on Sunday. Sir Michael Stoute’s 5yo gelding Abseil is our tip to land Saturday’s big one. I suspect it may be some time before F. Berry gets the leg up on another Chapple-Hyam horse after the ride he gave last week’s selection, Buckstay, in the Ayr Gold Cup. Held up out the back with the washing, he had to come from an impossible position, but finished best of all, going down by less than a length in fifth place. Not one of Fran’s greatest rides! Having got that off our chest let’s have a look at Saturday’s cavalry charge at Newmarket. Weight as we know is a great leveller, and only one horse, (Educate, 9st9lbs, 2013) has defied a burden above 9st5lbs since Cap Juluca won with the steadier of 9st12lbs twenty years ago. Indeed thirteen winners in the same period carried less than 9st. As always in these big handicaps, plenty of experience of racing in large fields is a must. An ability to stay further than Saturday’s nine furlongs is a definite plus with many previous winners having form over ten furlongs and further on their C.V.’s. A decent performance in their most recent outing has been of paramount significance, with hardly any of the last thirty five winners failing to perform in their penultimate race. With thirty five runners spread across Newmarket Heath you would expect the draw to be of some significance, but this has rarely been the case, and indeed in last years renewal the shd second was drawn on the other side of the track to the winner. That winner, the now 6yo Bronze Angel, tries for an unprecedented third win in the one hundred and seventy six years old handicap. The 2012, and 2013 winner, does thrive in the Autumn, and showed his treble aspirations were no forlorn hope when winning a Doncaster handicap last time off a mark of 104. Ridden by 3lbs claimer, Louis Steward, he won by 1 1/2L from that good yardstick Man Of Harlech. As his two previous wins were achieved off 95 and 99 he does seem to be up against it off his new mark of 108, but the Newmarket race does seem to bring out the best in him, so this 6yo warrior is not easily passed over. Sir Michael Stoute’s 5yo gelding Abseil catches the eye. He looked a tad unlucky last time at Epsom in June over 1m1/2f when racing off a mark of 99 he finished a nk and 3/4L behind Grazie, and Andrew Baldings filly Merry Me. As the Balding filly has gone on to aquit herself well at listed and pattern level, the lightly raced Abseil, who meets Merry Me on 4lbs better than Epsom, doesn’t look badly treated off a mark of 100. His run at Epsom suggested that further would suit, and as he clearly goes well after a break, is short listed. Michael Halford’s 3yo Teofilo colt Portage won a Cl2 Ascot handicap in July off a mark of 90 (1m sft) and ran a decent race last time at the Curragh, finishing second to the 5yo Hint of a Tint, with the useful Brendan Bracken back in fifth, off a mark of 98. Set to race off the same mark at the weekend, giving him a nice racing weight of 8st7lbs, and with William Buick in the plate he looks another well worth considering. David O’Meara’s 5yo Dylan Thomas gelding, Earth Drummer ran well when finishing 6th in a 1m2 1/2f, fifteen runner, York handicap last time out. He looked to have a chance at the furlong post but probably didn’t quite get home and went down by 4L. In his previous race at Ascot over 8f he was beaten a half length by Halation, whom he meet on a pound better terms on Saturday. His very talented trainer may well feel that Saturday’s intermediate trip will suit,and with stable jockey Tudhope up, is another well worth considering. Can Richard Fahey cap a great season by winning with his progressive 3yo gelding Third Time Lucky? Rated 91 after a close fourth in a Goodwood handicap at the end of July he probably needed to win at Thirsk three weeks ago to get into Saturday’s contest and did so in style. Leading on the bit over a furlong out, he went clear, and despite being heavily eased in the closing stages was still 3 1/2L clear at the line. Saturday’s examination will obviously be rather more rigorous, but clearly the Fahey gelding is on a sharp upward curve and with his light weight of 8st4lbs, it will be no surprise if he adds to the Malton Maestro’s burgeoning C.V.
E.W. : Third Time Lucky.